Today I’ve had the fortunate luck of getting one of Benro’s carbon fiber Travel angel to review. This is supposedly one of the lightest and strongest tripod available on the market. 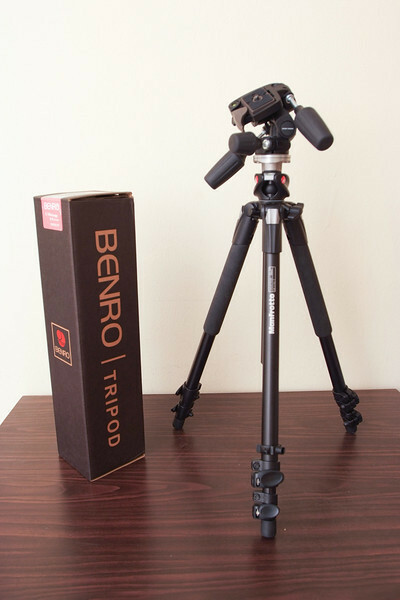 Benro is currently one of China well known brands among tripod makers. 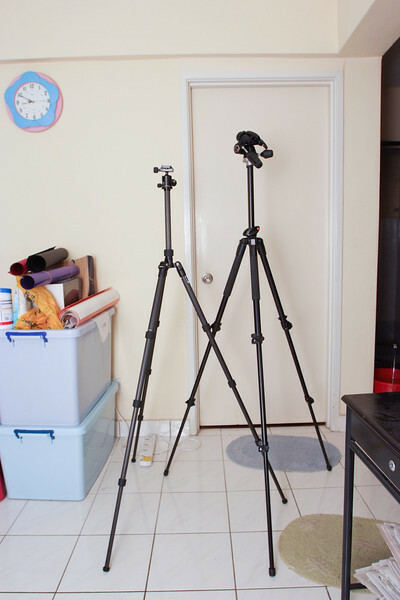 It appears a lot of their tripods’ design borrows heavily from Gitzo’s design as well as the material used. 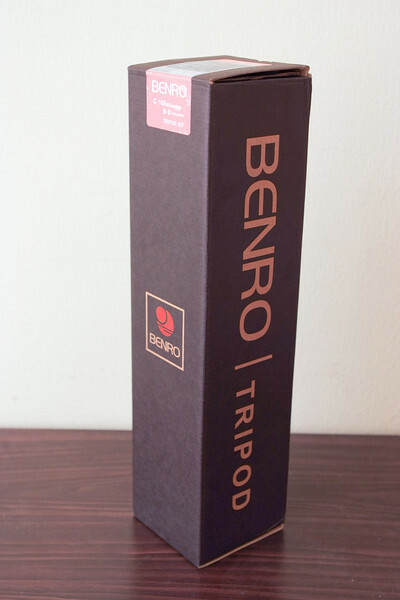 Which isn’t surprising as information has it that Benro is actually a spin off from the company that was manufacturing tripods for Gitzo in China. Though Gitzo denies this so I can’t say whether this is true or not but the facts are clear, the first batch of Benro tripod that were released in the market shared way too many similar characteristics with Gitzo tripods at the time (even down to where the Gitzo logo should be found) to be coincidental. Though it could have been that they just simply pirate right off from Gitzo , we’ll never know. Although Gitzo tripod have been reported to have undergone a much more stringent Q&A hence are of better workmanship (though from what I have compared, unless you are using a magnifier to check, you will hardly notice the difference aside from the main reason why they sell so well which is they are incredibly cheaper than Gitzo’s tripods). Anyway, on with the test. One of my biggest qualm I’ve always had with tripods is the actual weight of the tripod, you could get a lightweight tripod made of cheap alloy or plastic but then it would have problems of it’s own as such material were not very strong enough to support a mid range class DSLR properly and thus were restricted to light weight point and shoot cameras. For DSLRs, you needed some really tough tripods, which had to either be made from aluminum or steel but such material have the trade off as being heavy. The weight of Benro’s Travel Angel series is about 1.25 Kgs though it feels much lighter than that upon first inspection. Here is it after I’ve taken it out of the box and it’s bag. Its roughly 2/3 of its size when fully folded up. I then pull out my heaviest DSLR configuration that consisted of the Nikon D700 with Sigma 70-200 f/2.8 which weight at about 2 kg here. The package consist of the bag, a hex wrench, manuals (who needs a manual for a tripod anyway? ), tripod (duh!) along with a ball head. Note in some stores, the ball head is not part of the package and it sold separately so don’t be fooled as to why one shop sell at a much cheaper price. Its most likely that they do not include the ball head as part of the package, check to make sure else you might end up paying more. Here is the benro fully extended and how it stands up to the manfrotto, pretty close for something this light and small. One complain though, the rubber twist lock on the legs can really rub burn your hand if you don’t have a firm grip on it when twisting to either release or lock. Where as the Manfrotto uses the latch lock system. Benro claims that the 168-M8 can hold up to 8 kgs of camera weight which is rather amazing as my manfrotto can only hold up to 5 kgs. 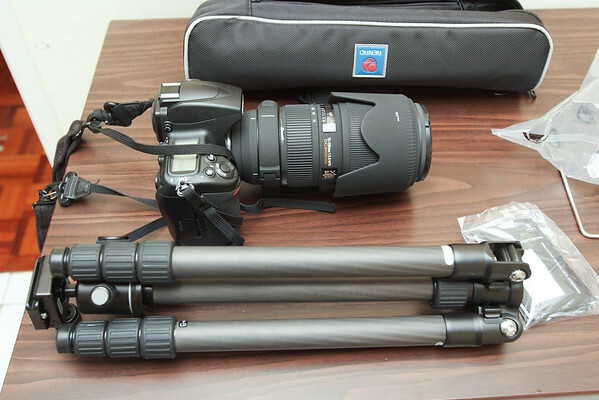 As you can see, both tripods perform quite well. 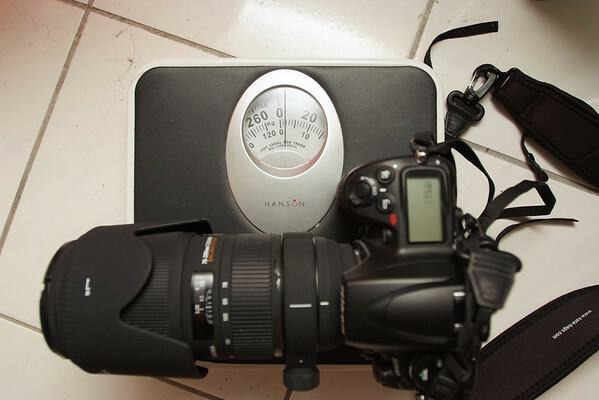 Personally I think the manfrotto feels like it can definitely hold more than 5 kgs, maybe up to 8 kgs. While the benro feels likes like it can take up to definitely up to 8 kgs and more if you tried. The strength of the carbon fiber used to make it definitely lives up to it’s claims and it does this all without feeling like a ton. This is not a deal breaker complaint but a minor thing I found either odd or just annoying that in no ways effects the benro in a major way. When I was mounting the tripod plates onto my camera, I found that the Benro plates required the use of a hex wrench which I found in the bag. Where as the one for manfrotto didn’t require any tool to tighten onto the camera. What this means is that you may find some trouble securing the tripod plate onto your camera if you decide to switch from the body of the camera to say the tripod collar of a long lens if you don’t have the hex wrench. 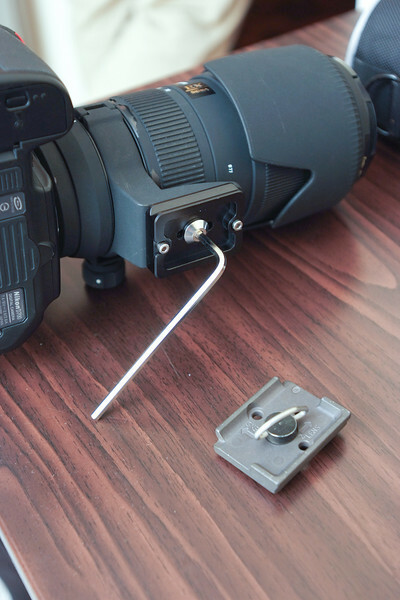 Though with the manfrotto plate, you can just simply screw it on with your hands without any problems. Though if you have 2 of them or just don’t forget to bring the hex wrench then it should be no problem on the field. One more thing I forgot to mention, while my manfrotto tripod can be easily setup for macro shoot, the benro has no such feature at all, at least for the travel angel line. But this is only important if you want to do tons and tons of macro shooting. This is more like the hiking tripod you need for landscape shooting. Well I say the Benro wins here, first its way much lighter (1.25 kgs) and its able to hold just as much weight (8 kgs) as any other larger and heavier tripod without any problems. 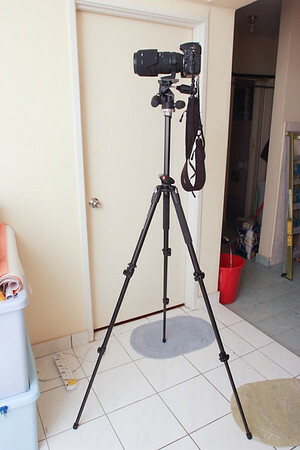 Its also incredibly compact making an ideal travel tripod ( I could fit it into my backpack without any problems at all). 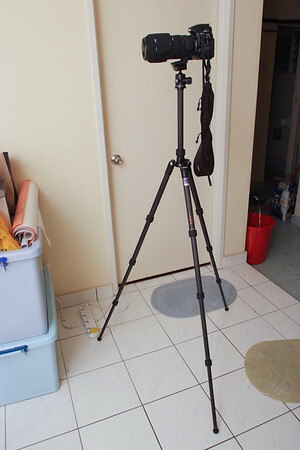 Though it isn’t cheap when compared to heavier tripods but definitely much cheaper than other tripods in the same class. 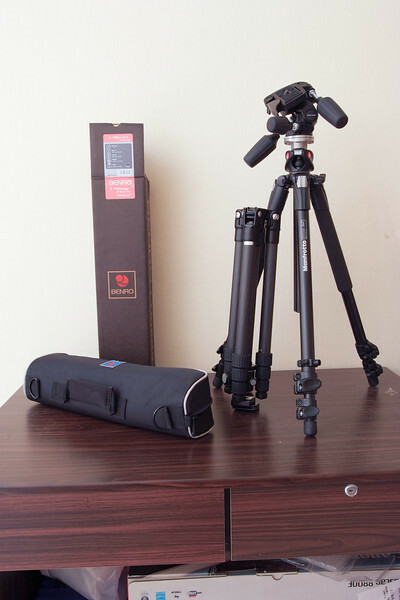 If there is one tripod to get , its this one though you’ll be paying quite a price tag. It cost 3 times more than the manfrotto tripod. But the benefits are about 5 times more than the manfrotto. So would I buy it? Well put it this way, after carrying out this test, I quickly sold my manfrotto off and bought one. That is how good I think it is. Why do you choose this over Benro C-269? Do you think the 269 will be more stable? Its not that I did not chose the 269, I didn’t even know that there was one. But even if I did, I still would have made the same choice simply because it was smaller and the weight it could support was well within my camera’s weight class. No need to get anything bigger than that else I would have ended with the original problem as with the manfrotto.